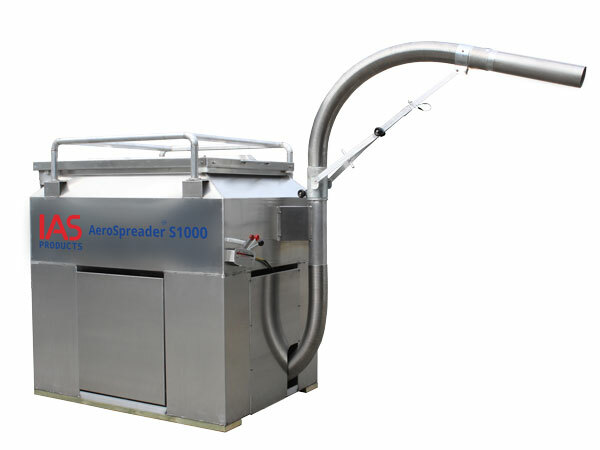 The AeroSpreader™ S1000 is our largest hopper sized stationary or mobile model dry pellet aquaculture feeder designed to handle 2.0 to 11.0 mm extruded feed pellets using a 9.0 hp Honda® motor direct driving an Aerite™ AB150 model blower. An optional Aerite™ AB150E model electrically powered and frequency drive controlled blower is also available for stationary AeroSpreader™ S1000 feeder models to provide even higher feed delivery volumes and feed broadcast distances. The 1,000-kilo/2,200 lb capacity marine aluminum hopper is specifically sized to work with these larger Aerite™ AB150 model centrifugal blower to provide operators the benefits of maximum feed rates and broadcast distances from a feeder sized for mobile operation. This model AeroSpreader™ is the largest wheeled model offered operating on large pneumatic wheels for easy rolling over deck or walkway ropes and cable obstacles. Just a few of the many equipment options include remote stainless steel cable controls for operator selection of best feed blower speed and feed delivery rates, ideal for vessel bridge or truck cab positioning. A range of feed broadcast hose configurations can be selected including the self-supporting 360-degree manually aimed Periscope Feed Head™ shown here to an electrically powered, operator aimed Periscope Feed Head™ designed for optimum hands-free operations using an automatically oscillating feed broadcast head. For operators requiring the maximum feed broadcast distances possible, IAS offers a fully supported feed boom assembly that positions a long length of feed broadcast tube for optimum feed spread and coverage. A direct drive Aerite™ AB150 model blower requires no belt/pulley adjustments. 12.7 cm/5-inch Blower Outlet: Large air volume air plenum for high volume feed delivery rates and broadcast coverage. Feed hopper profile will accept positioning of our largest Aerite™ AB180 model centrifugal blower for even higher feed delivery rates and feed coverage. Easy operator maintenance and repair and best reliability. Using the optional Periscope Feed Head, operators can quickly aim the feed broadcast nozzle for best-feed placement without re-positioning the feed vessel or truck. Provides 360-degree feed outlet nozzle aiming so that it is easier to adjust the feeder’s feed outlet nozzle than to re-position the vessel or feed truck. Feeds four cages from one feeder. Install one Feeder to feed four cages: Use the optional 360-degree rotating Periscope Feed Head and position an AeroSpreader™ feeder at the junction of 4 cages. Aim the feed outlet feed nozzle without moving the AeroSpreader™. Up to 90 kg (200 lb) maximum per minute of 9 mm feed pellets. Note that feed delivery rates increase as feed pellet sizes decrease. 6.7 Kw (9 HP) gasoline powered Honda motor.